So work continues to get this car on the road. 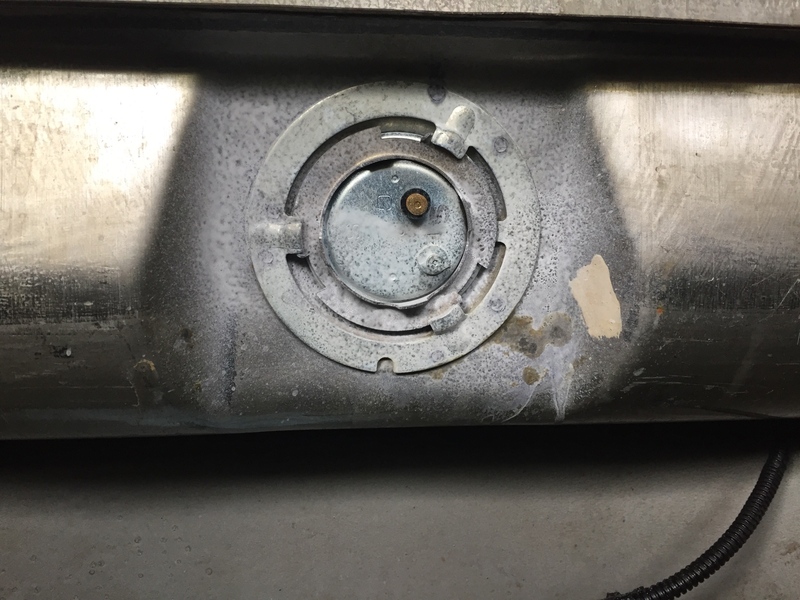 While cleaning out the fuel tank, I realized that the supply line was clogged. Compressed air would not blow it out. 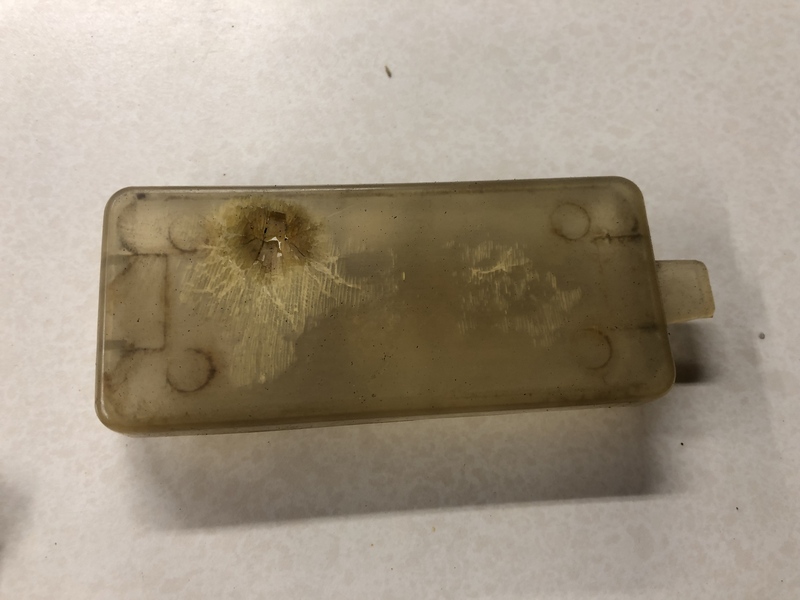 It was submerged in that crud for years it seems and was plugged solid. Since there is a bend in the line as it enters the tank, I couldn't just poke it through. I got a tip from the JB Coachwerks racing crew on how Sam solved that problem on their race car Swamp Thing. Some patience, Carborator cleaner plus a zip tie did the trick! Here is the tank as it sits before I use POR 15 metal prep on it (the next step). Way better than where I started ha ha. Time to work on the rear suspension too. 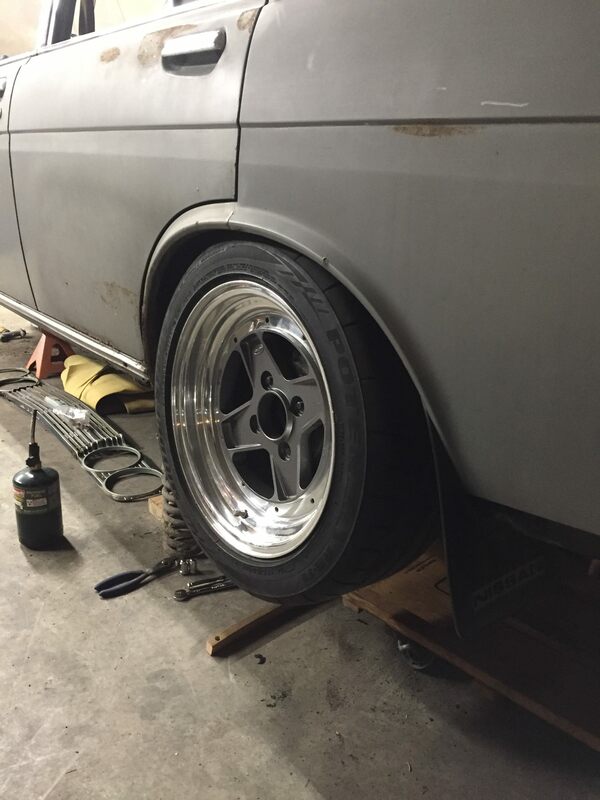 I removed the stock shocks for the 2 door and got around to installing the coilovers. If they rub, I will go back to the steel wheels and hubcaps when the 2 door comes back from paint. Should know pretty soon! I have some SSR meshes that might fit!!!!!!! 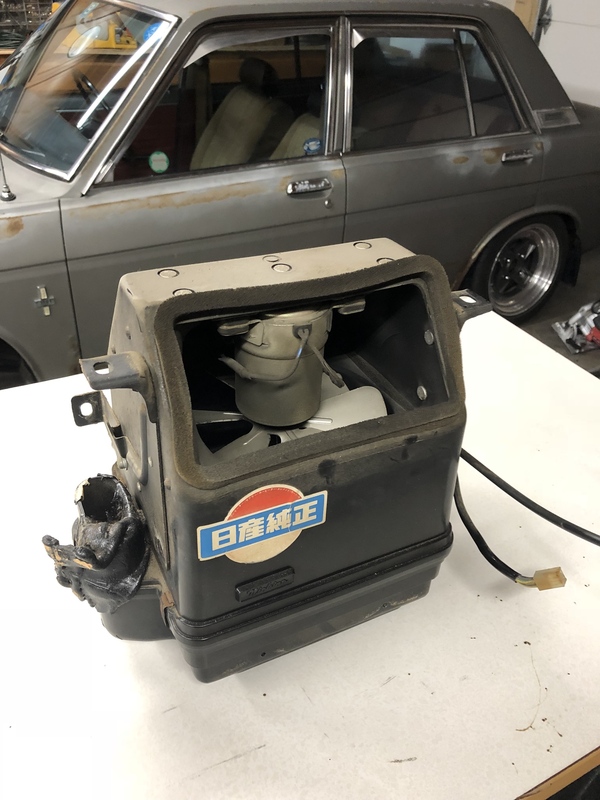 Man you can tell this is one of the first, because the very first 510's didn't come with a breather on the rocker cover. Awesome car & well worth the resto. One month 'till Canby Paul! Are you going to make it? Ok so the fuel system is mostly sorted. 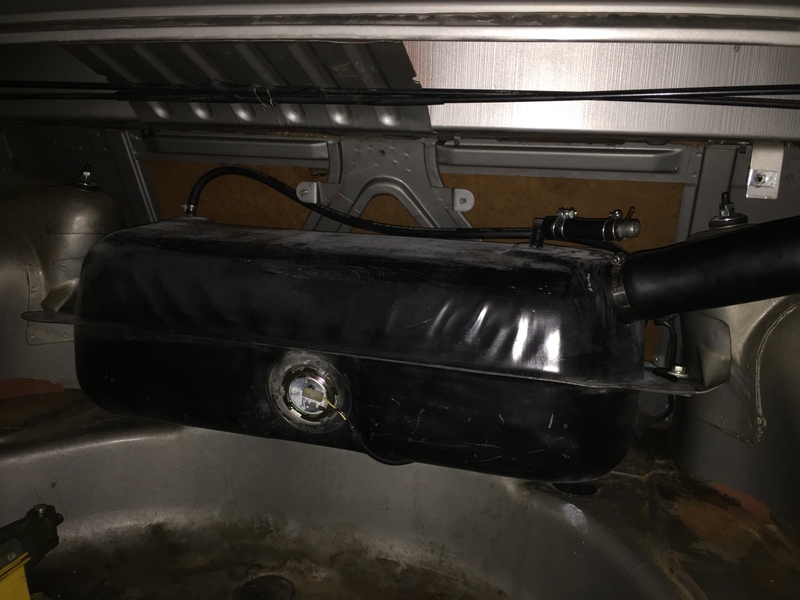 After cleaning the tank I decided that the fuel filler hose that was already showing some cracking would either get replaced now, or slosh fuel into the trunk before too long. 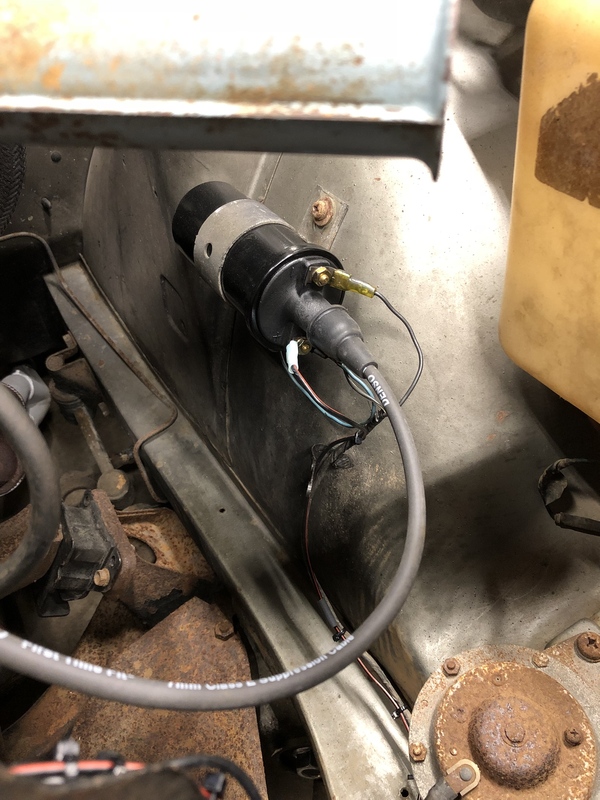 Since I don't like the smell of gasoline in my car, and I don't want to burn it down, I decided to replace the fuel filler. My research found several ways of doing this. I like the reproduction pieces that are available, but this car has the early style one piece rubber hose. 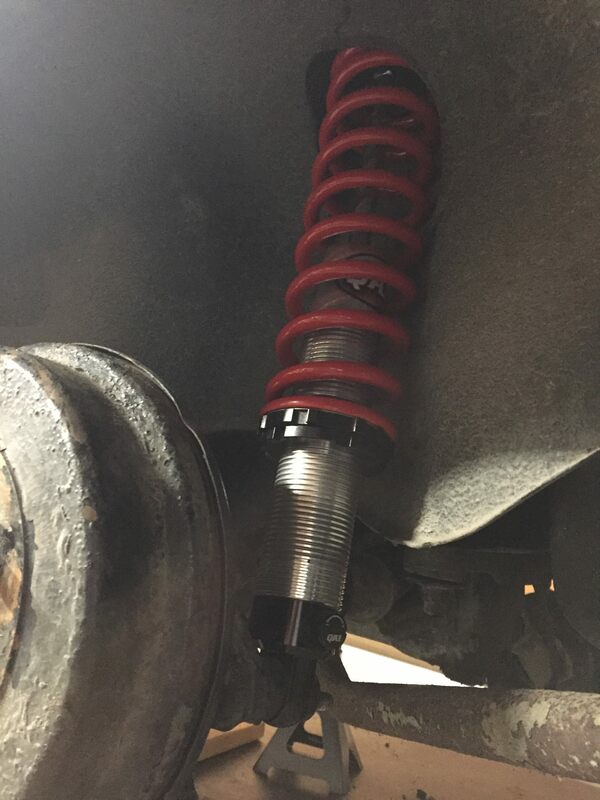 I chose the after market replacement set up for the 93 Ford Ranger. Readily available and inexpensive as well. I could not find a detailed write up on how to do it, but realized as I got to it that it is really easy. 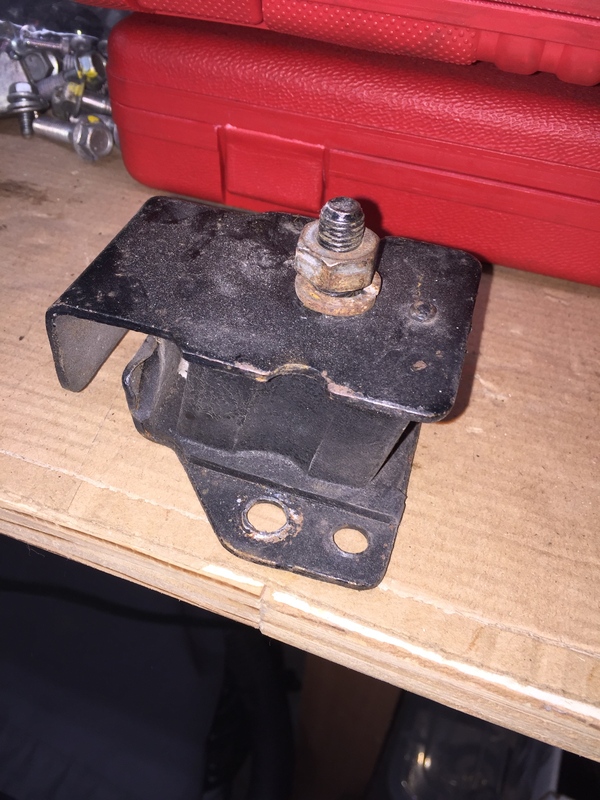 I used my belt sander to flatten the bottom of the mounting flange so it would fit the car. Hit it with gloss black engine paint to cover the bare metal and done. Only 3 new screw holes in the car. Cut the hoses to the right length for a clean fit. 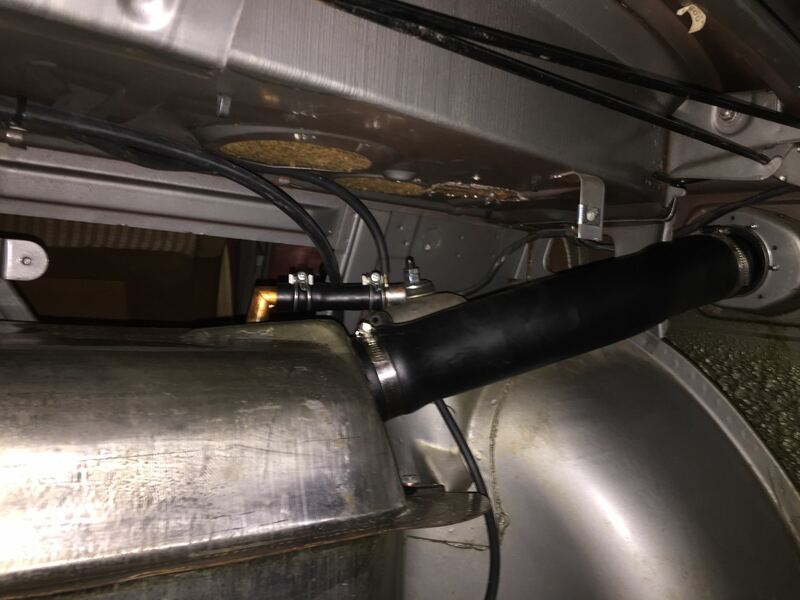 This set up uses a hose within a hose for the fuel nozzle shut off. That meant I had an extra port on top of the fuel tank that would not be used. 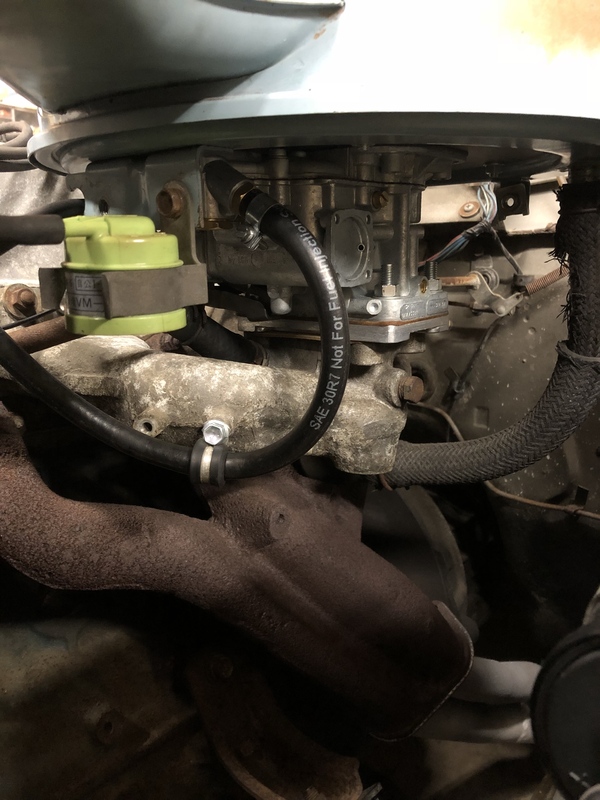 I decided to use the original hose and t fitting for the tank vent set up and cap the end with a standard 1/2 inch copper pipe cap that is soldered in place. Neat and clean enough for me. A bit of a scare to see if the fuel door would close, but it turned out ok! Somewhat fitting that the above image is the last one I posted. That was right before Canby 2018 and I still had hopes of sorting this car out enough to make the trip. Shortly after that post the key and the Pooh key chain went missing. Like really not to be found anywhere. After hours of searching I gave it up as a lost cause. You all have spare keys right??????? I did not focus on this detail and found myself unable to make progress sorting out the car. No spare key, no Canby trip for the Bluebird. ? My awesome wife told me it was a good thing as the car probably would not have made it. I am not sure that helped me or not, but she was right (again). If you ever find yourself in this predicament, Google is your friend. 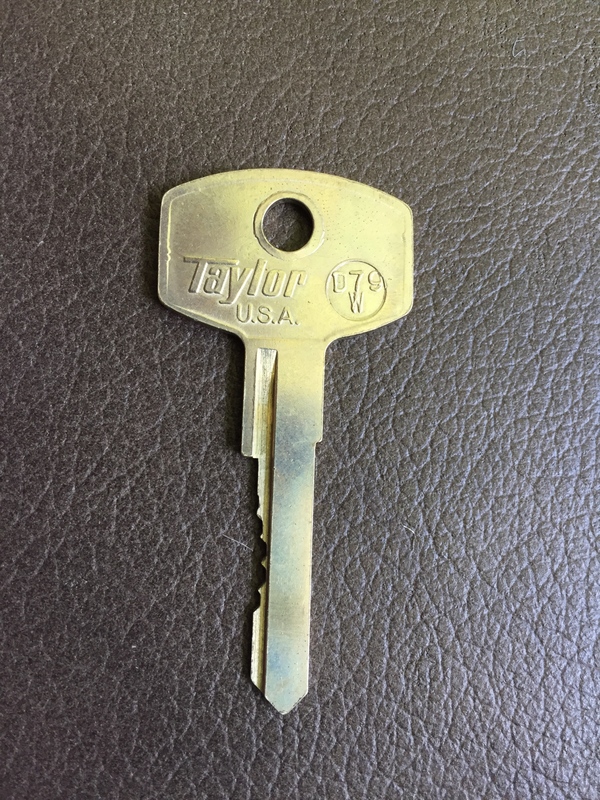 I found a place to have some spare keys made based on the key code number. I picked the wrong key blank for the cut, it came out way too long. A little careful time on the grinder, comparing the pictures I had of the old key and I was in business again. 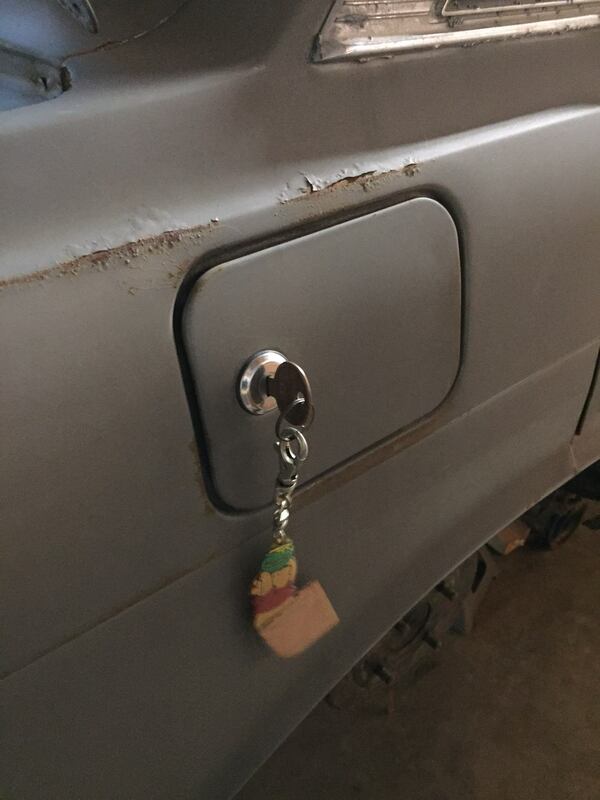 All the lock cylinders work great. Back to sorting out the fuel system. I had the cleaned out tank back in with the new filler hose. Lets add some fuel! Ok where is that fuel smell coming from? Fuel leaking in the trunk. Oh man! Seems to be coming from the fuel sender O ring. 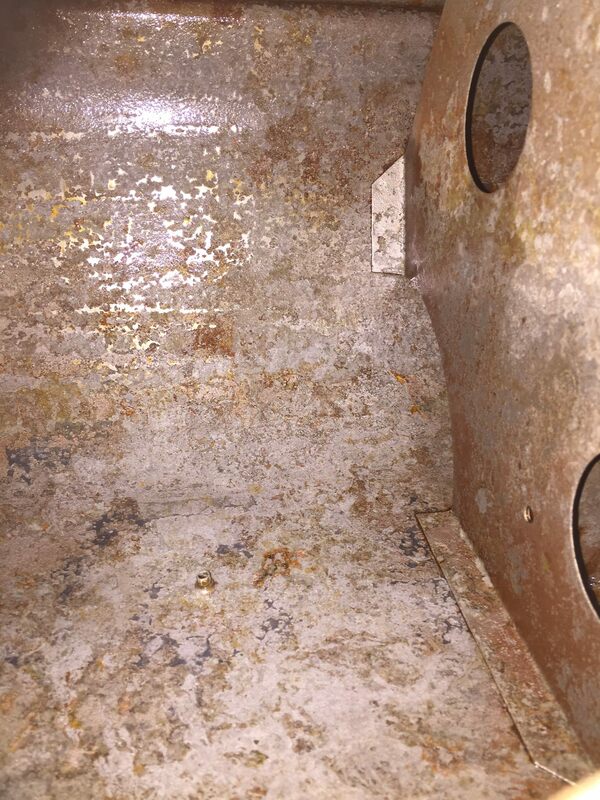 Several cycles of drain the tank, check the O ring, clean the area, replace the O ring etc. Still seeping and cant really tell where it is coming from. Time for a trick we use at work. Tracing powder spray. 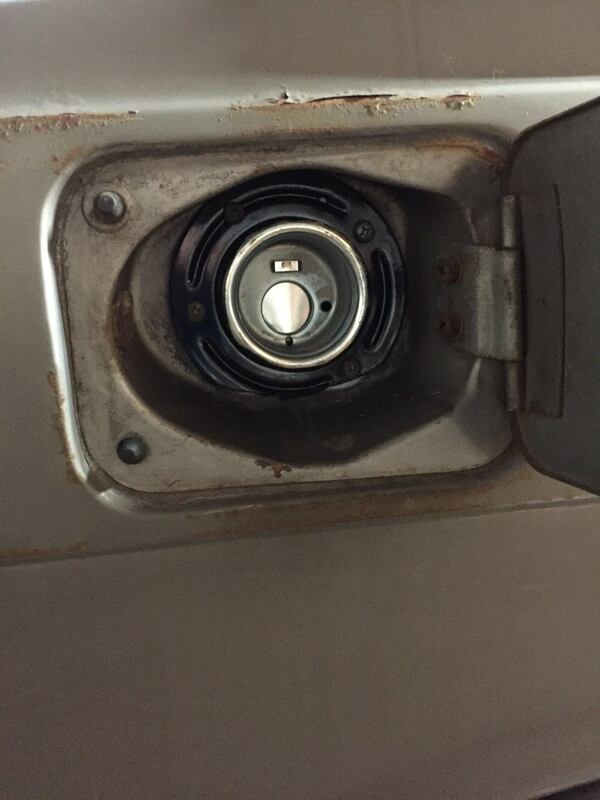 It leaves a white residue that will change colors when there is a clear fluid leak such as gasoline. See the darker spots on the tank at about 4:30 - 5:00 close to the fuel sending unit? 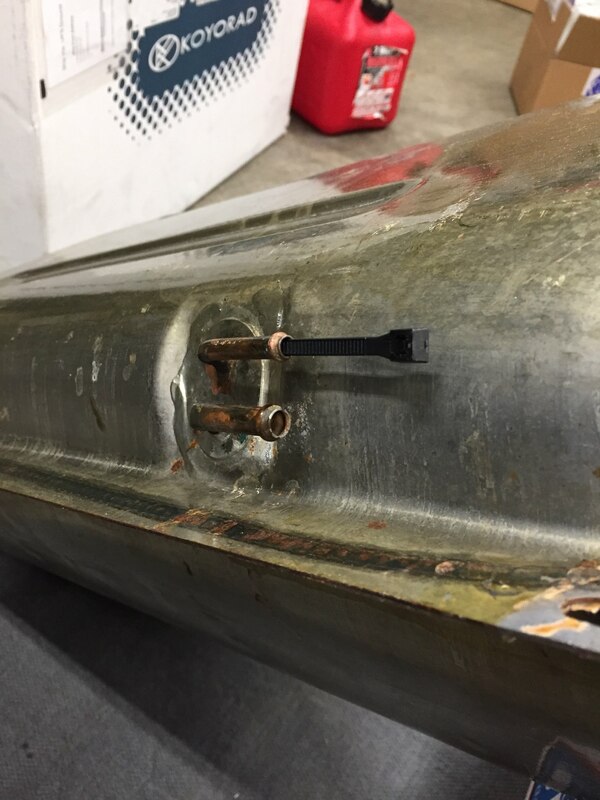 Yeah, pin holes in the steel tank. Found some others on the bottom of the tank too. Lots of them. My POR15 attempt to reseal the tank had some de lamination of the coating that was really frustrating. from what I read online, the coating was too thick or it was not clean enough. Either way not a success. Time to search for a new tank. Special thanks to Jeff for coming through for me on that! Much better! No leaks! With the fuel supply sorted out, time to run the engine again. After running it for a few minutes, it developed a misfire that was not isolated to any 1 cylinder. It needed normal tune up parts replacement anyway so in went new plugs, wires and cap/rotor. Same issue. I decided it was time to upgrade the electrical systems to help make this car reliable. The battery tested poorly so time to replace it. I found that new batteries here in the US have different size terminals for their connections. They are much larger and make the old lead cable ends unusable. So... time to replace cables too I guess. I came up with a solution based on what I use here at work. Yes it is much more modern looking, but the terminals are now protected, It will function perfectly and it has a clean look. What do you guys think? On with more electrical. New battery can't stay alive by itself. How about that charging system? 12.2V when running is not enough. 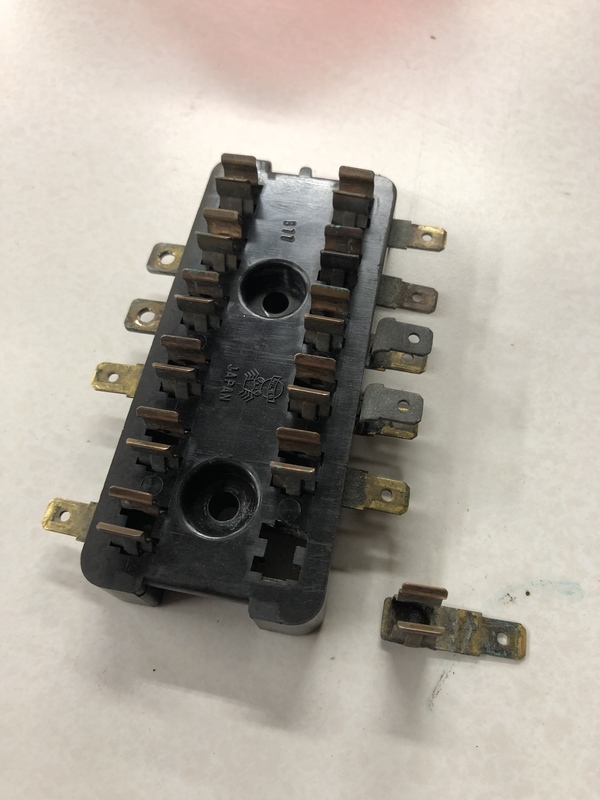 I noticed some issues with the fuse box when I did a quick fuse check. 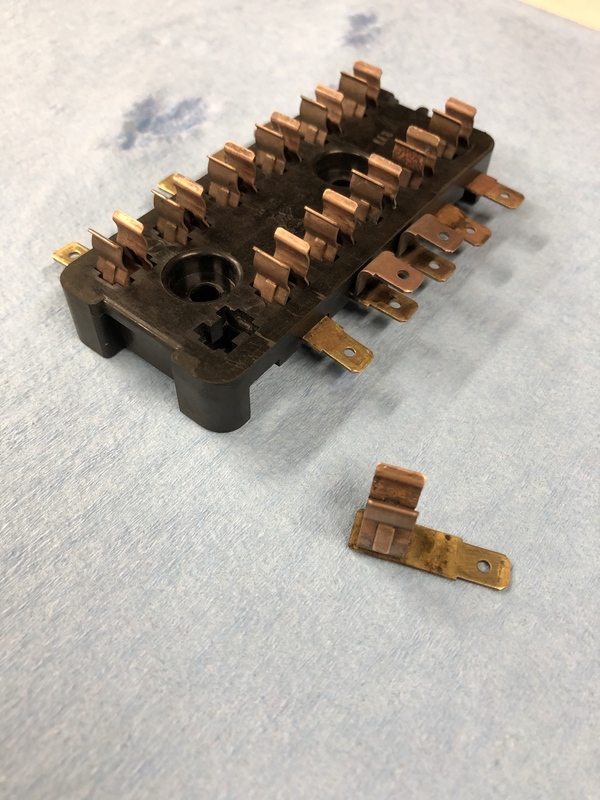 20A fuse let go as soon as I replaced it. Hmm what has been going on here? 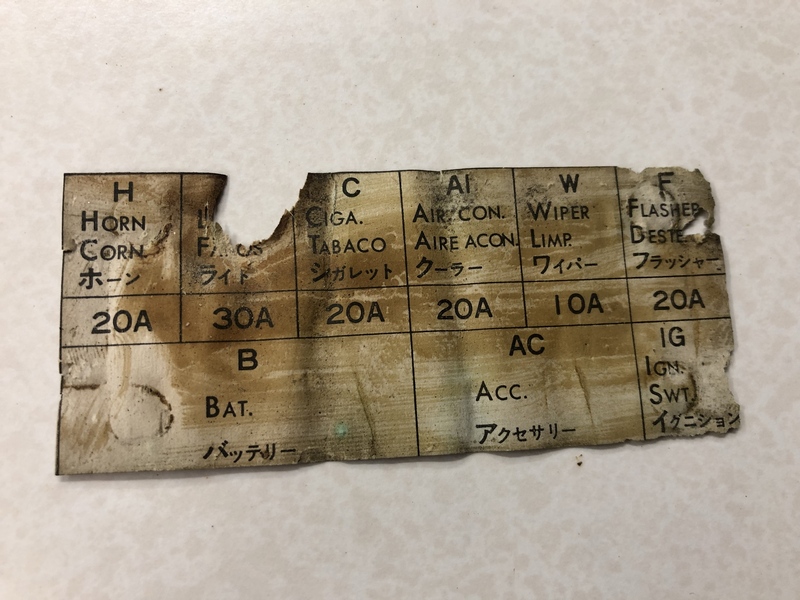 Note the paper diagram of fuse location with what used to be a clear cover. 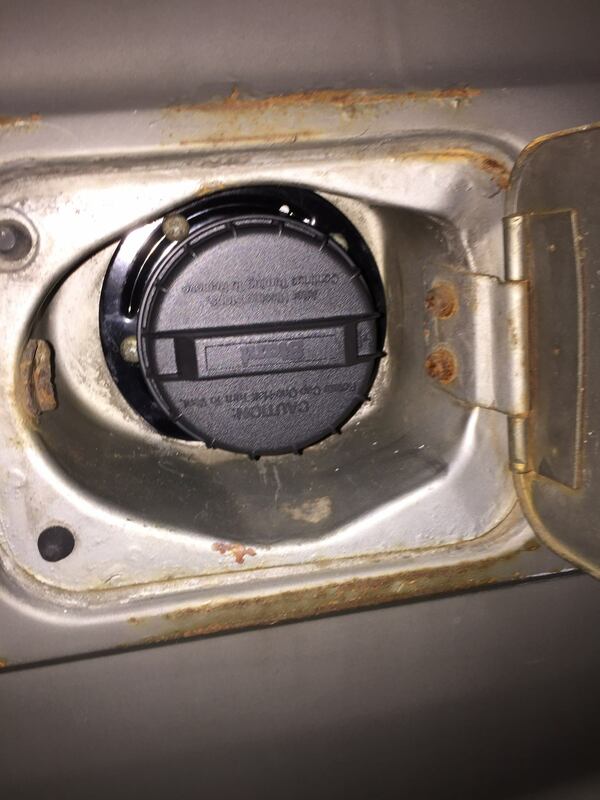 Found the cigarette lighter socket is shorted to ground. Unplug the single wire and the short is gone. 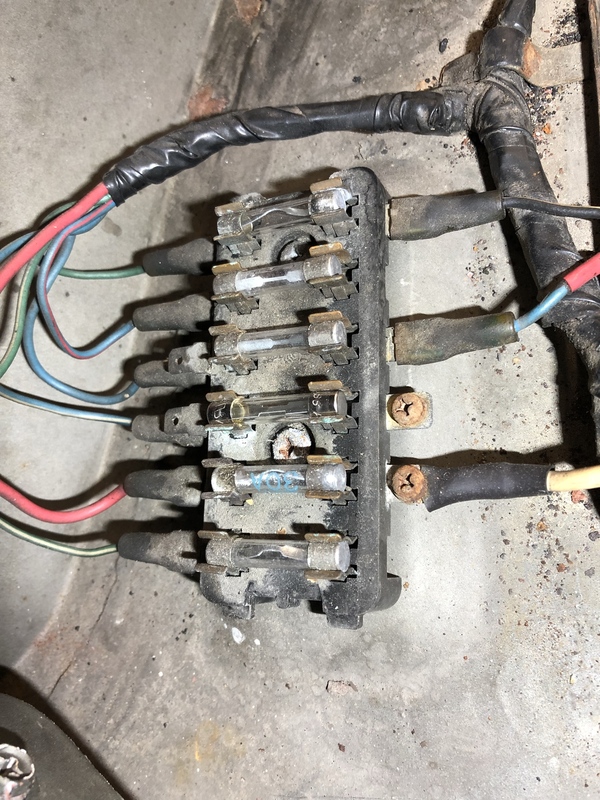 Still having a voltage drop at the fuse box for the sense wire that feeds the alternator. Time to clean up connections here. And after about 2 hours of soak time. My experimentation with this method showed me not to leave it in too long. It will eat up your stuff! 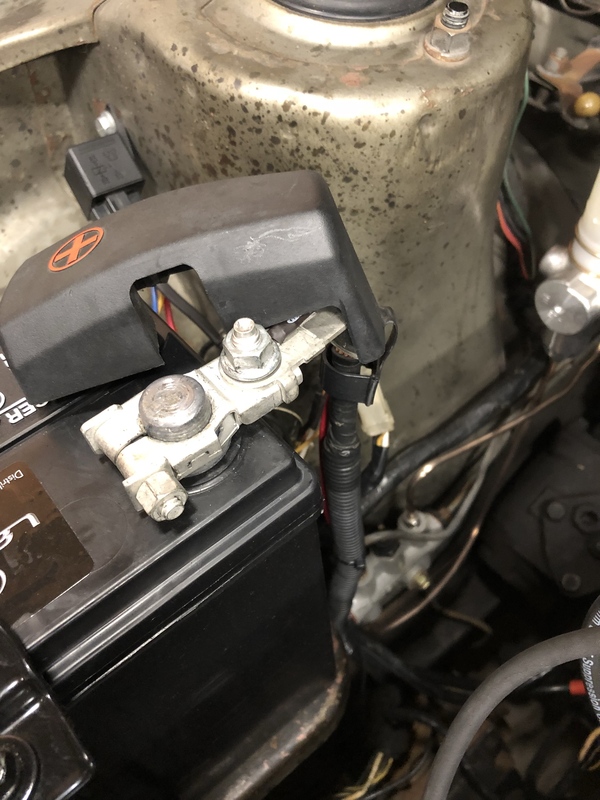 The addition of two jumper wires into the external regulator connector had me in business at 13.8V. Some of these posts are out of order. I had a gap in time between updates and am trying to piece it together here. 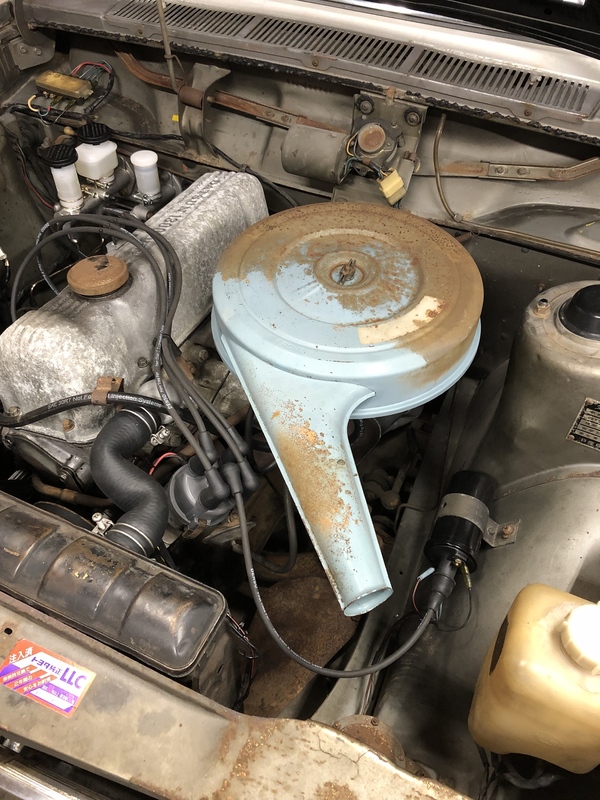 I noted a radiator leak early on in this process of getting the car on the road. I really like the Koyo option for this car. So much so I went ahead and got one. Shiny goodness right there. One of those upgrades that make you feel good every time you see it. Fitment was ok, but required some spacers away from the core support that brought it close to the engine fan. It still worked, but made me nervous. Fast forward to the first test drive in the neighborhood. The car stalled about 2 blocks from home and would not start again. I had to do the walk of shame. 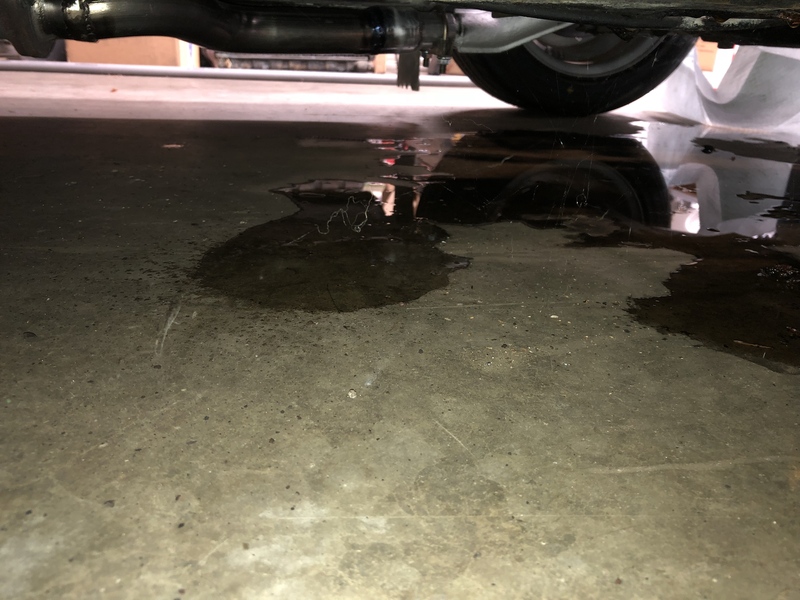 When I came back with my truck and a tow strap, I noticed coolant leaking from the car. After towing the car home I traced the leak to the new Koyo radiator core leaking at the bottom tank. Not what I expected for sure. Cursing in the garage stays in the garage. The place I ordered it from was no help as it had been too long since purchase. 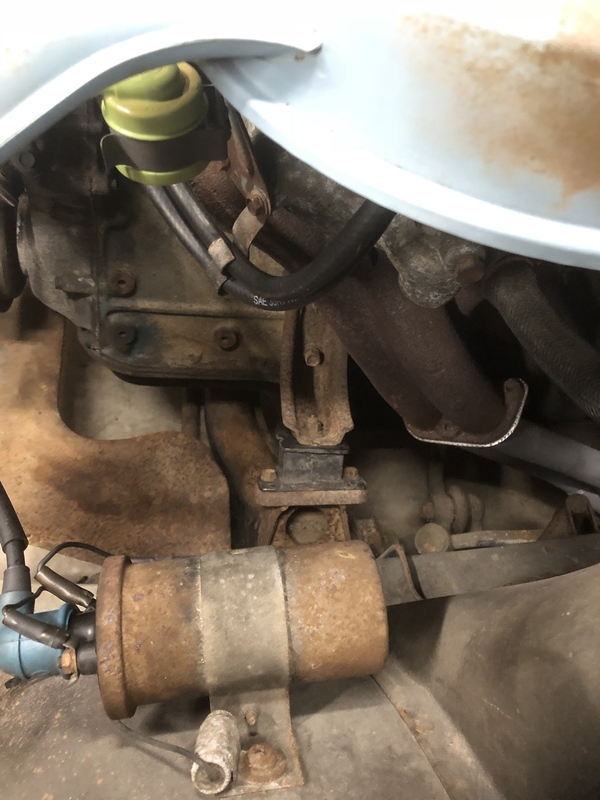 I was looking into getting some help from Koyo when I realized the motor mounts on the car were shot. I could tell because the upper radiator hose was yanking the radiator and core support when I revved the engine! Too short of a hose for the amount of movement led to a cracked radiator. Can't warranty that for sure. Special thanks to my good friend Carter for hooking me up with a stock radiator that really helped out. You are the best! 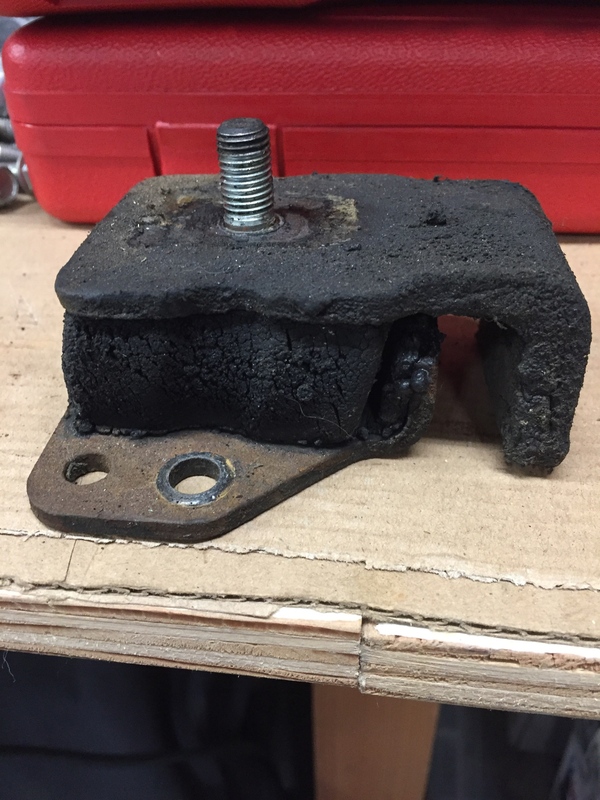 Bad motor mount! Go sit in the corner! I had the replacement mounts stashed away in a box. Should have installed them sooner I guess. Live and learn. I had to borrow a dwell meter to set the ignition points on this car. I used to have a cheap one in my tool box for use on customers' cars. It had been such a long time since I used it, it got tossed out during one of those garage cleaning purges you have to do from time to time. 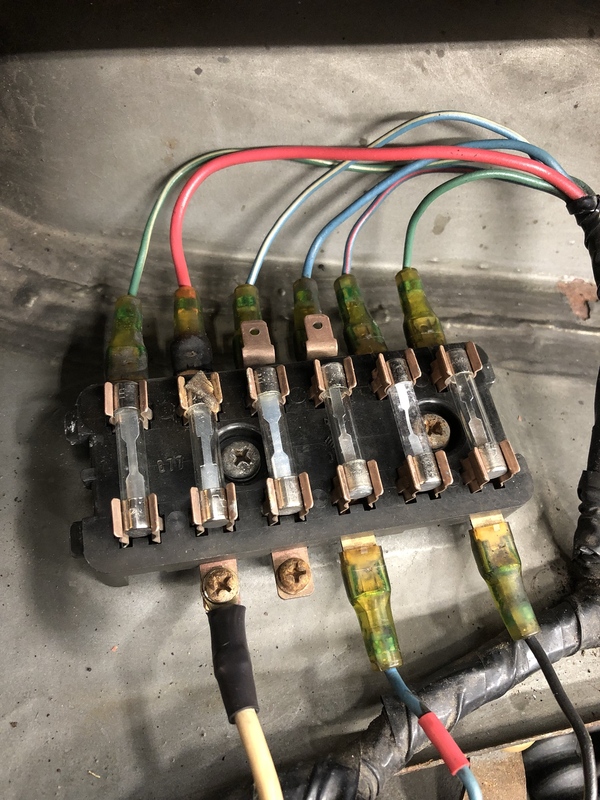 While setting the points, I was reminded what a great step forward electronic ignition was. Since I was still fighting a misfire on the car I decided to upgrade to a Pertronix system with a matching coil. What a difference that made. Starts right up and idles smooth. Yeah! 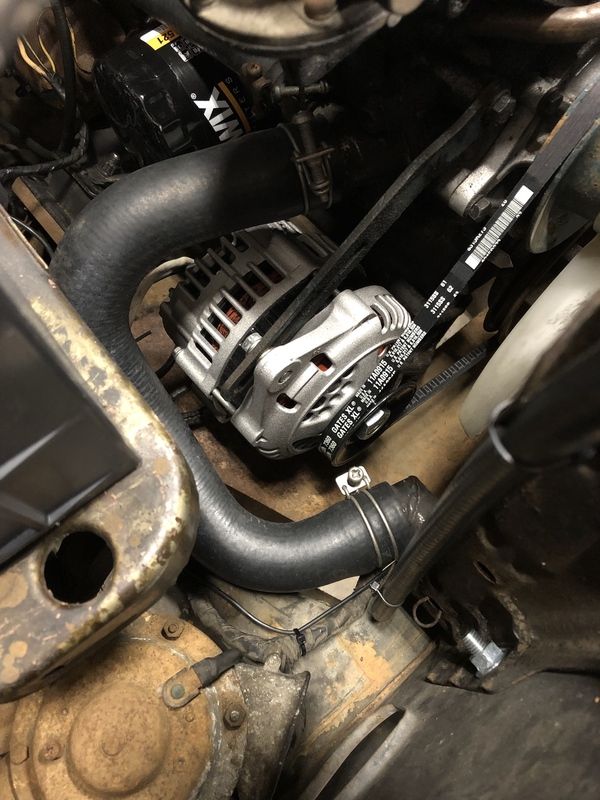 One thing I like about the Pertronix system is how it can hide under the stock distributor cap. Not so with the "blaster" coil. Had to face the label away from view to make it better. I guess I could have peeled it off too. Dang.. bummer on the radiator. I was going to say.. leaky from the factory? No way!! 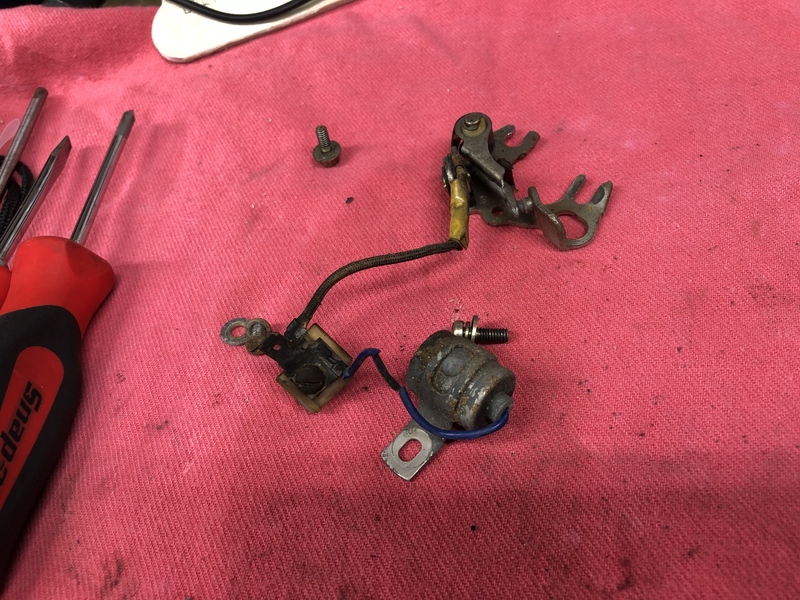 One of the things I dislike about carburetors is how much you have to mess around with them. I have rebuilt many of them in my professional and personal life. Yes it is old school and the gasoline smell is part of owning an old car, but I just don’t like it. 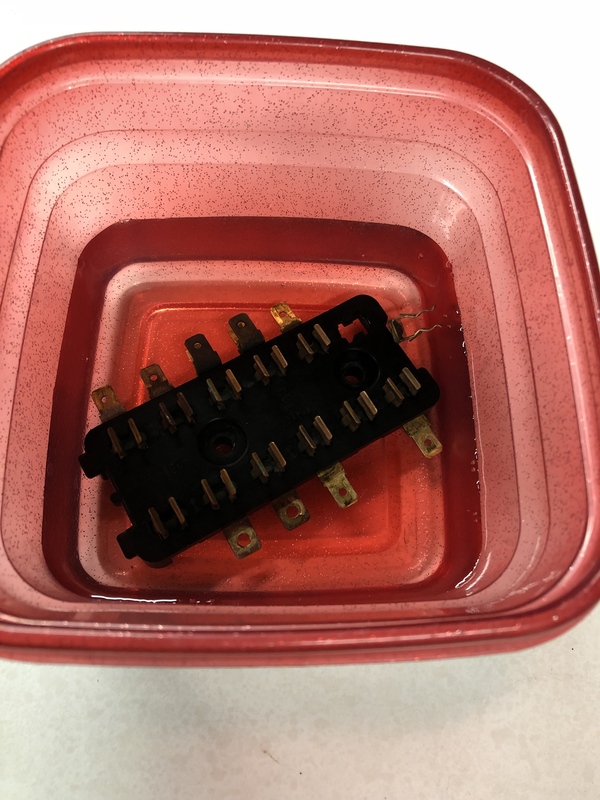 Having said that, the carb on the L13 was still giving me problems after a thorough cleaning and parts replacement with what I could find for it. 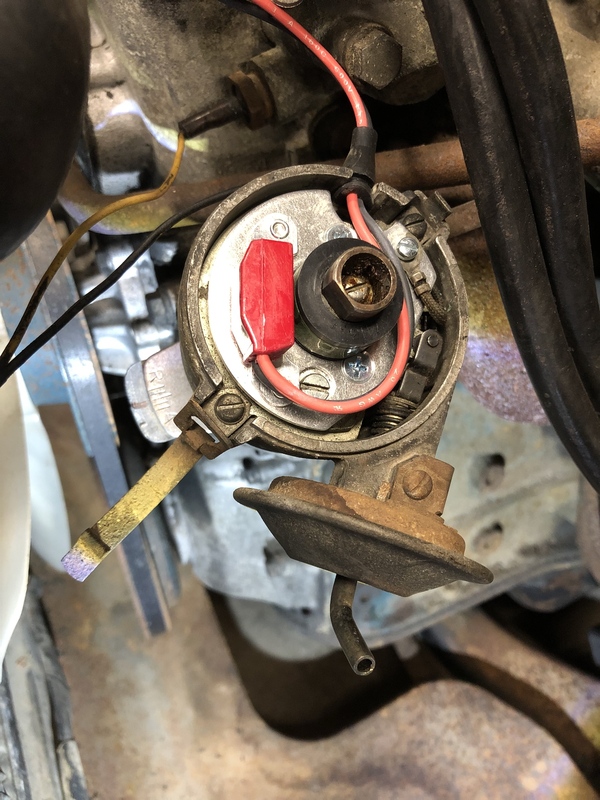 Inconsistent idle speed and fuel mixture along with intermittent flooding due to a float needle valve problem led me to an uncomfortable question for myself. How much am I willing to spend on this L13 trying to save it? Long term goal for this car is not yet determined. I was trying to run it as is until my 2 door is on the road. Then see out what the future holds for this car. 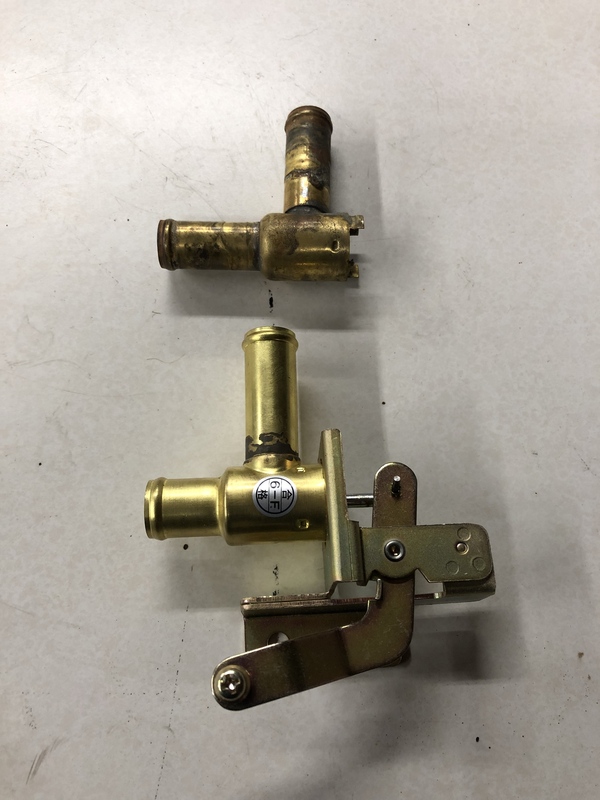 I could find a used Weber 32/36 somewhere, but I would probably find myself having to rebuild that one too. I decided to take a gamble on the L13 and buy a new Weber for it. That would allow me to tune it and leave it alone for a while. That sounded good anyway. After searching around for the correct Weber kit, I resorted to pictures of the kits to determine which to order. 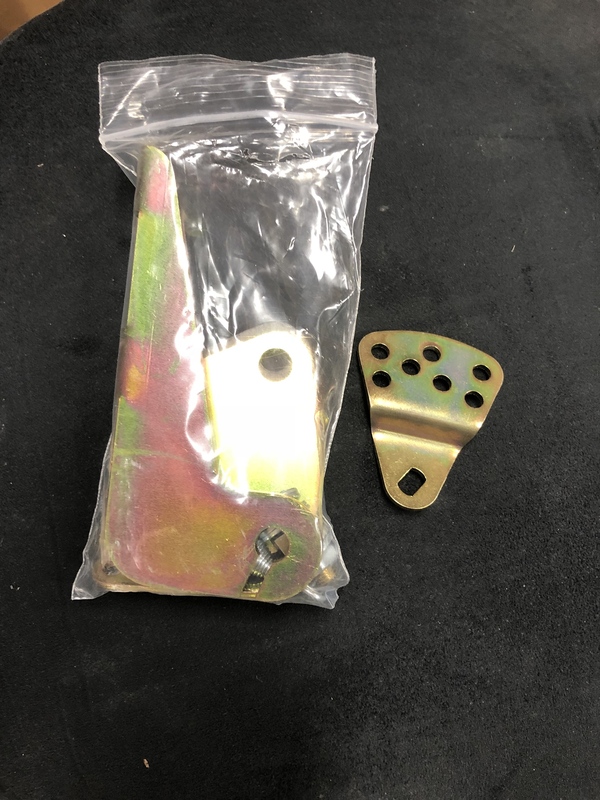 I knew I wanted an electric choke 32/36, but I needed the correct throttle linkage. I seemed to be running into kits over and over with cable throttles for some reason. I know the US 510’s used mechanical linkages so this was a bit confusing. 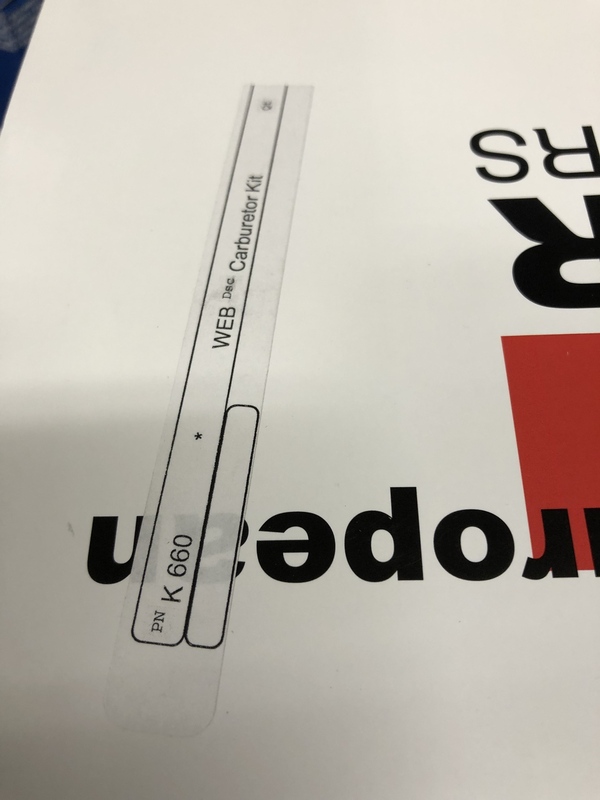 I ended up ordering the K660 kit based on the Weber web site for application, and a picture of the kit with the correct linkage. Yeah not good enough. It came with a throttle cable set up. After looking at my options, I realized I could use the linkage from the Hitachi carb on the Weber. Good thing. After mounting it on the car and sorting it out, I decided I didn’t like the chrome air filter the carb came with. It didn’t seem to fit the theme of the car with the L13 in it (stock looking). 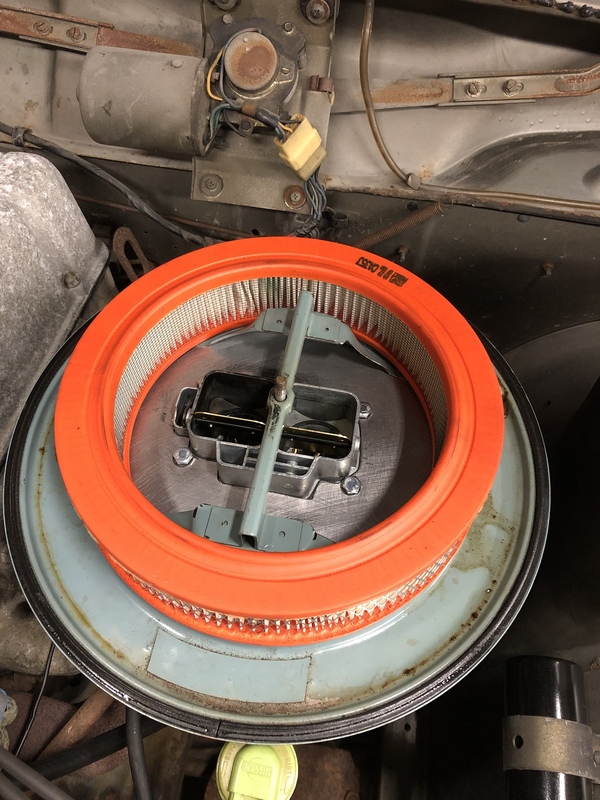 Time to cut up the original air filter housing and make something to fit the Weber. 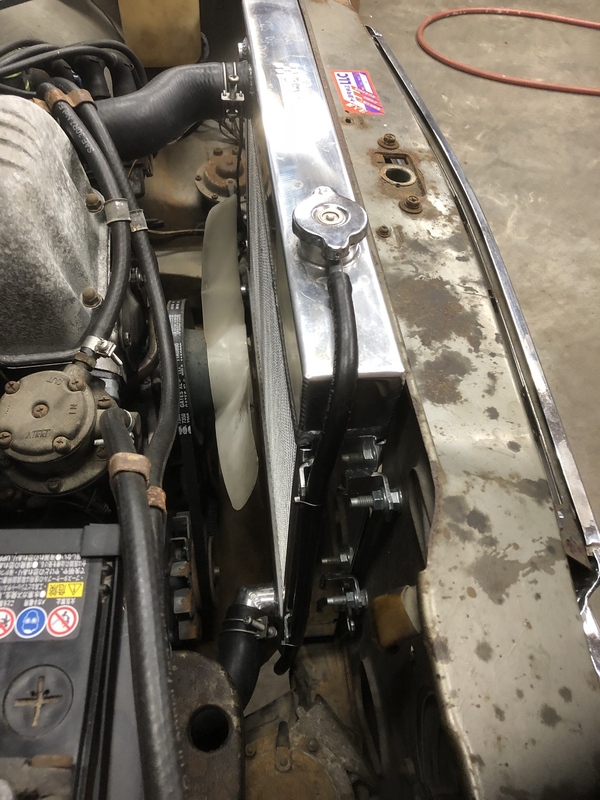 After some quality time in the garage and lots of cutting and grinding, I came up with a steel plate adapter that would allow the stock air filter and housing to work. I am not the first person to do this, but still feel pretty good about how it came out. I like the stock look Paul. 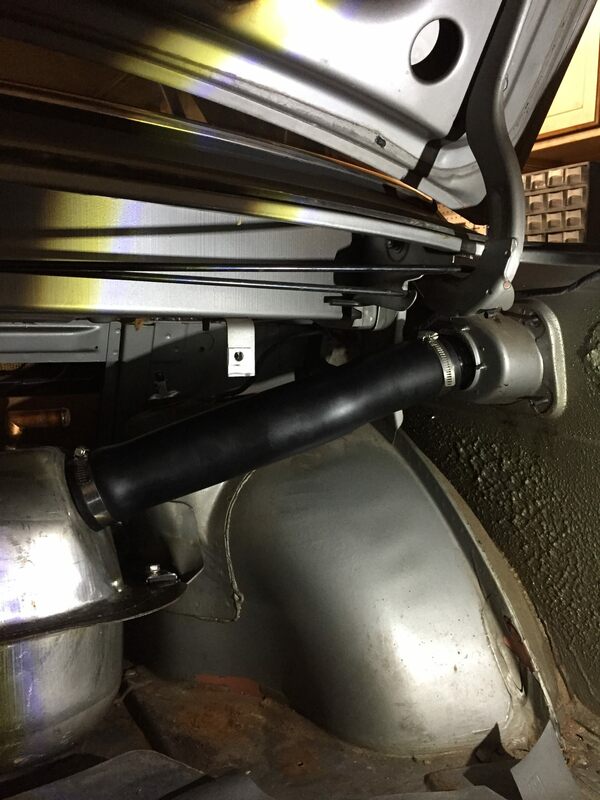 Looks like your upper radiator hose needs a little trim. It's trying to fold over on itself. Or is that a trick for quicker warm-up in winter driving conditions? Double that bid to move the fuel line. 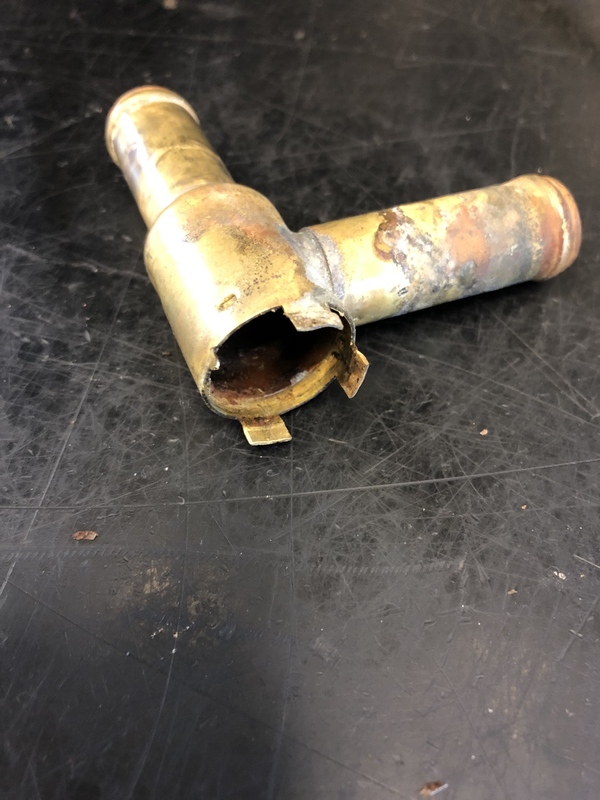 Hot gas will be an issue if the soft line isn’t first. 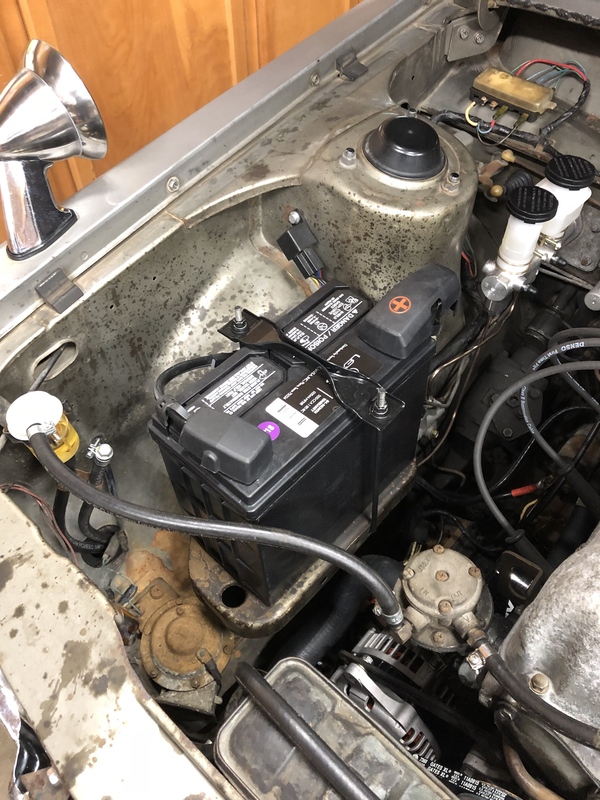 I was running the car in the garage to cycle the thermostat and fill the cooling system. While poking around with the flash light I noticed coolant on the garage floor. Strange, I didn't see any leaks under the hood. A look from the side behind the tire showed the leak coming from the front floor area. Oh man the heater core or valve is leaking. Not going to be an easy fix. 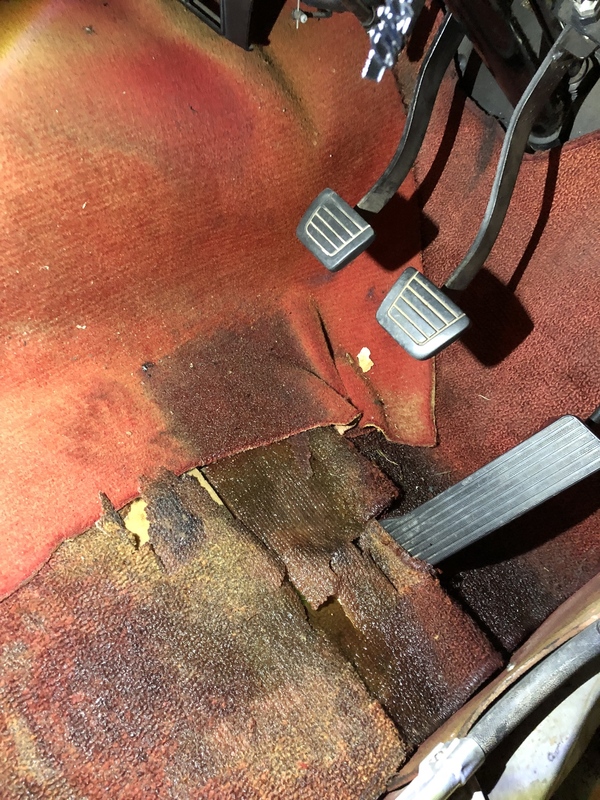 Some nasty carpet there, but the clutch and brake pedal pads are in pretty good shape. 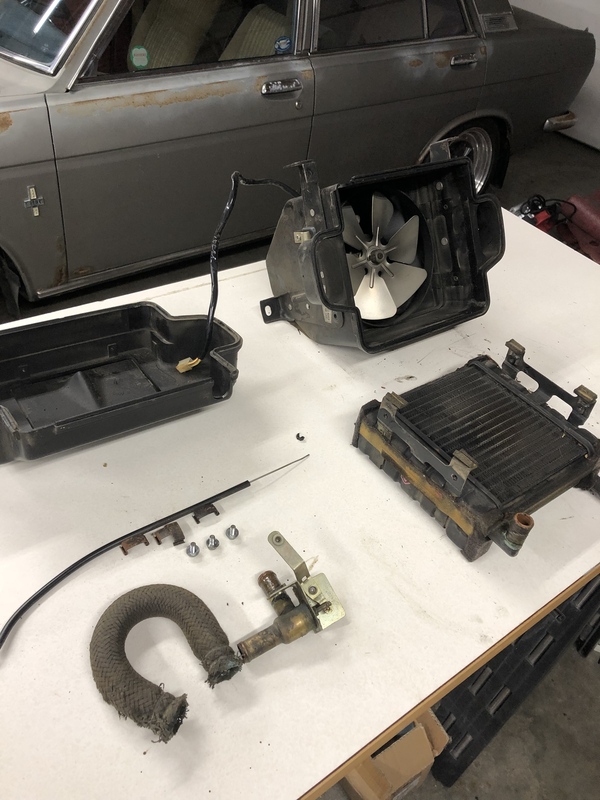 Time to take it apart and see what is up. 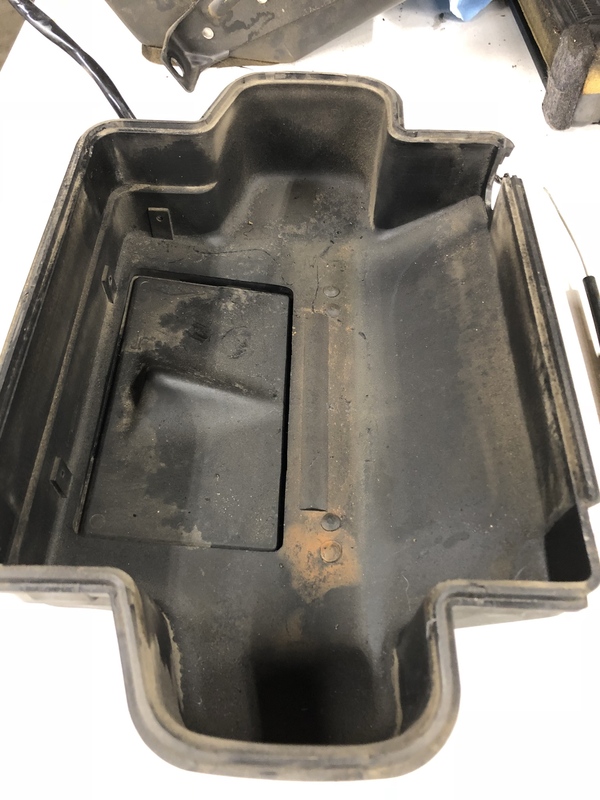 The heater box came out way easier than I am used to at work. All the components laid out for consideration. The original rubber hose had to go for sure here. Note the fan is the early blade type, but also made of metal. I compared this with another fan from a US 68 510 and found that one to be plastic. Interesting how these cars evolve during production. 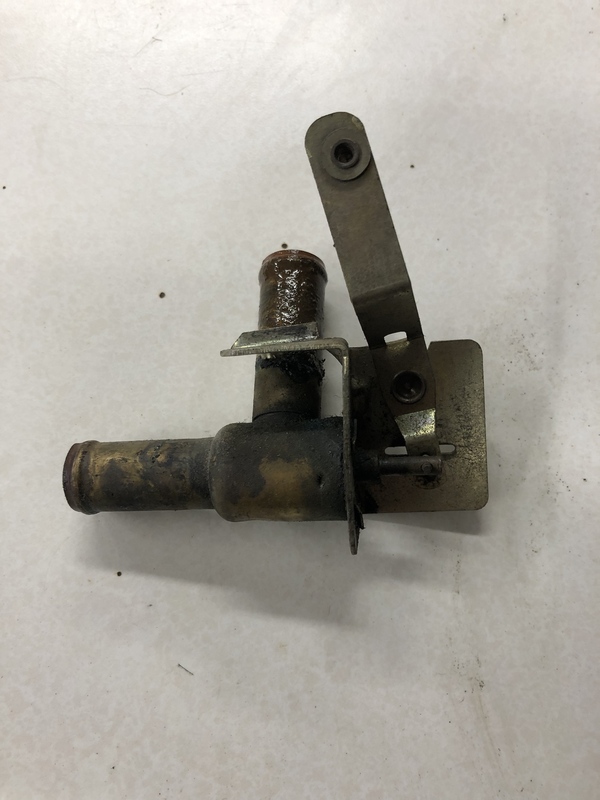 Early style heater valve that would fail pressure testing in the water tank at 5psi. 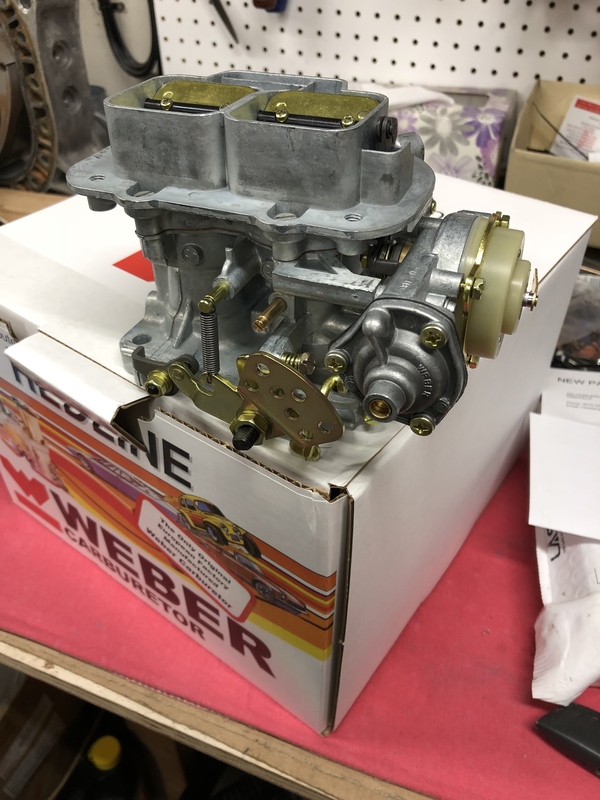 Having seen what my 69 valve looked like, I was expecting that this one would not be rebuild-able with O rings due to its early design. 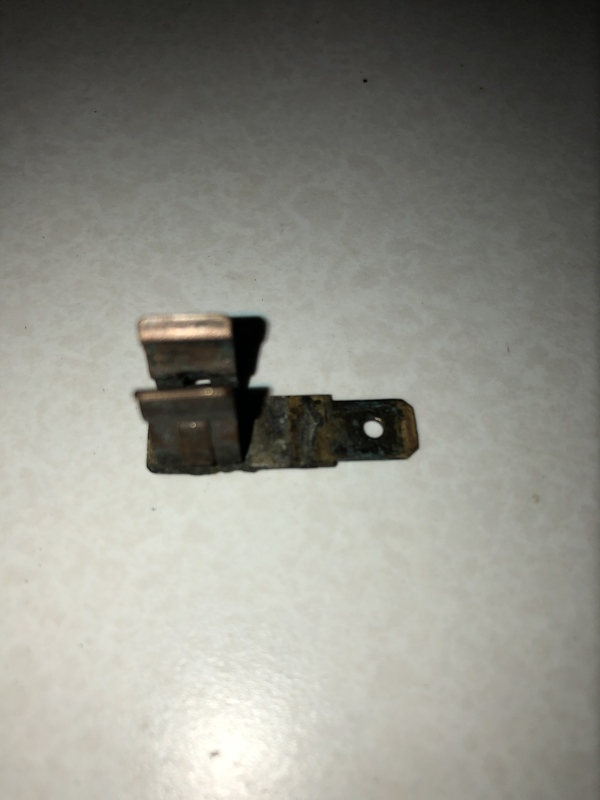 After taking it apart as carefully as possible, one of the mounting tabs broke off. Here we go looking for a unicorn!